The crash of the property market in Ireland in 2008-9 and the subsequent collapse of the banking sector wreaked absolute havoc. Ireland was lumbered with debts for a generation by the EU/ECB/IMF who brokered a deal to keep the ATM machines working once Ireland agreed to pay back French and German bond-holders the billions they had invested. It was a typical example of private debt being nationalized and converted into public debt. It is a process that has happened many times in world history in many countries but is the first time that Ireland has suffered such a massively damaging blow. Many private home-owners were left in the lurch. Those who could still afford to pay their mortgages did so. Those who struggled mostly struggled on while those who could not were left in the greatest difficulty. Against this backdrop and a decade later the announcement that Permanent TSB and Ulster Bank are to sell a huge tranche of ‘under-performing’ mortgages, over 25,000, to private funds has been met with a surprising degree of opposition. Statements by the hierarchy of the banks that ‘some’ of the loans being sold have not had a single repayment for over seven years have fallen on deaf ears as the entire process is politicized. Fianna Fail have been quick to position themselves as the Political Party offering support to hard-pressed home-owners. Clearly they dont give any credence to the banks hints that the mortgages in questions are held by opportunists who are waiting on their own private bailout from the Government. Permanent TSB has total mortgages in arrears of 28%, more than five times the typical banking rate. Ulster Bank has 16% of their mortgages in arrears. The banks have not helped themselves in this regard and have released scant details about the loans in question. Had they been willing to prove that over half (for example) of the loans are in arrears for a number of years then the issue may have dissipated. However, in the absence of quantifiable data the opportunity to make some political capital out of the situation has been seized upon. The spectre of wide-scale evictions was clearly one that was too much for these banks. 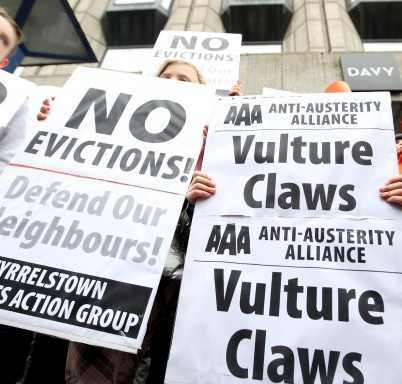 Instead they have sold that particular hot potato to the so-called ‘Vulture Funds’ who presumably have no such concerns about the negative publicity that evictions attract. These mortgages and properties have suddenly become much more attractive given the massive price increases in property in Ireland over the last few years. It is quite clear that the buying funds are eyeing new owners or new tenants for these properties. A decade later the effects of the financial crash in Ireland have not yet been fully realized.